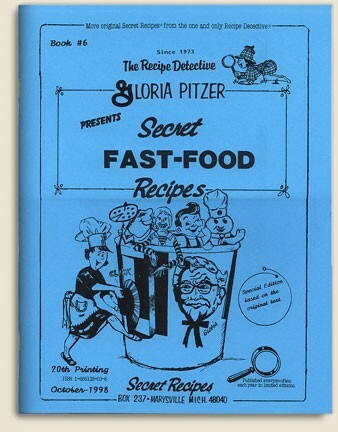 1985 – Gloria Pitzer’s Secret Fast-Food Recipes (aka: “Book 6”) was written, illustrated and published by Gloria Pitzer (Gloria Pitzer’s Secret Recipes, St. Clair, MI). NO LONGER IN PRINT – this cookbook is a reprint of the original, 1st printing in August 1976, having 120-pages with a 5.5″ x 8.5″ format. It boasts 458 index listings and sold for $6. 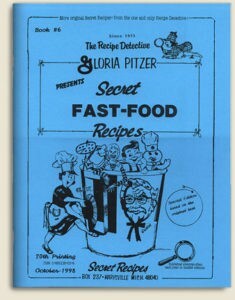 Secret Fast-Food Recipes was Gloria’s return to restaurant dishes, focusing on the “fast food” industry again and developing more recipes for making famous “fast food” products at home. 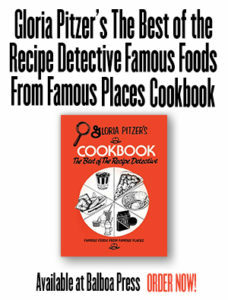 Over the many years and various printings, the cover changed slightly, as did the size and price of the book – the size changed in 1996 (around the 11th printing) to a 60-page, 8.5″ x 11″ format with 288 recipes listed and sold for $8.75 per book. This cookbook covers everything “from soup to nuts”, imitating franchise foods and snack products, candies, coleslaw, drinks, desserts, soups and salads – imitating big name chains as well – using wholesome ingredients. This is the book that has outsold all others! Every recipe that you ever wanted to try that imitates a famous franchise food or fast food chain menu item is included in this 120-page collection. Price: originally $6.00 for the 1985 reprint, then, $7 in Fall ’90; the larger size sold for $7.50 in Spring ’95, then $8.75 a year later. By Nov 2000, it was $9.75 per book. My mother bought me this cookbook about 20 years ago, and I can tell you this is one of the greatest cookbooks I have ever owned, and certainly the FUNNEST! 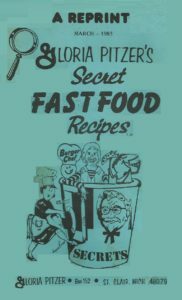 In this wonderful cookbook you will find all of the “Secret Sauces” to your favorite hamburger joints (some of them long out of business, but the taste can live on! ), such as “Burger Chef’s” secret sauce, how to make a “Big Chef”, How to make a “Super Chef”, how to make chicken that tastes exactly like KFC, Popeyes, or CHURCH’S fried chicken. This is one of the finest collections of recipes that you’ll ever come across, so don’t hesitate, don’t even think about it, you will cherish this book forever. 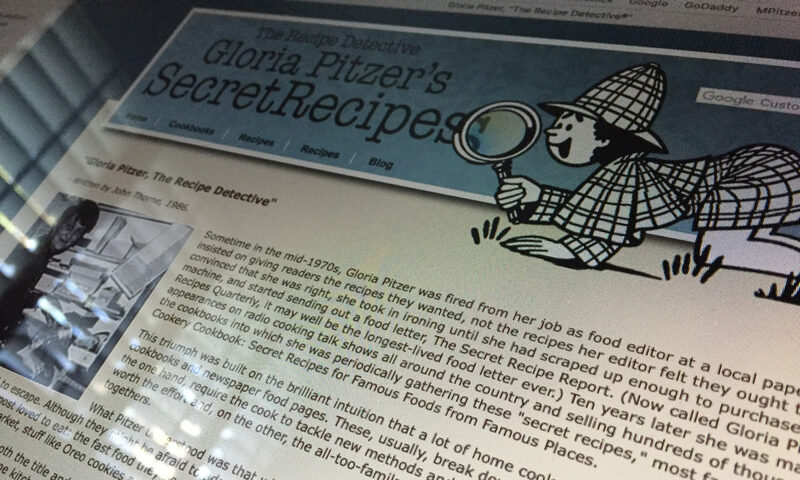 My copy is in great shape still, and I use it all the time, and on the internet when someone talks about a recipe from some restaurant chain they used to go to years ago and asks for the recipe, I am OFTEN able to look it up and post it for them!!!!!!! Good luck in tracking this one down though!